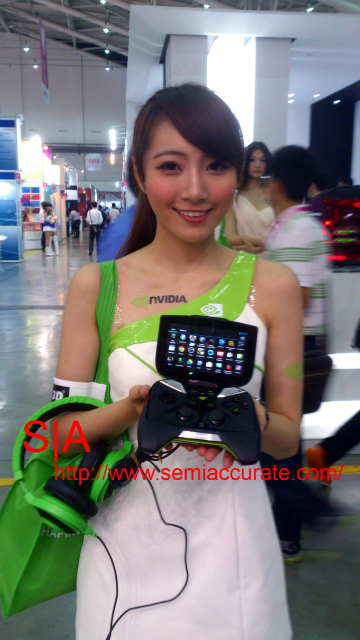 Continuing our walk on the showfloor, we encountered an NVIDIA showgirl standing in front of a partner booth, with NVIDIA Shield on her hands. Surprisingly, there are no NVIDIA (or partners) PR around, which probably is a sign of confidence to us. So we decided to have a hands-on session with the device, but sure enough there are restrictions and some unmet expectations at the end of the day. We would like to thank NVIDIA for the absence of their PR people. Without them, we can have a hands-on their proudest product, the NVIDIA Shield. 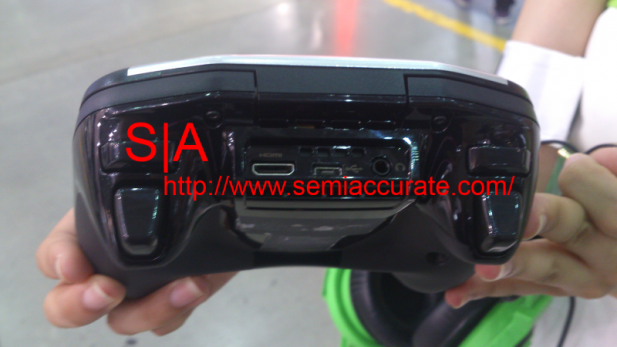 “That’s bulky” was the first thing we feel after getting the NVIDIA shield in our hands, and given its stated weight of 579 grams, it’s 2.5 times the weight of Nintendo 3DS, and 319 grams heavier than PlayStation Vita (Wi-Fi). actually, when you look at the image above, the NVIDIA Shield console looks disproportionately bulky in the hands of the showgirl. 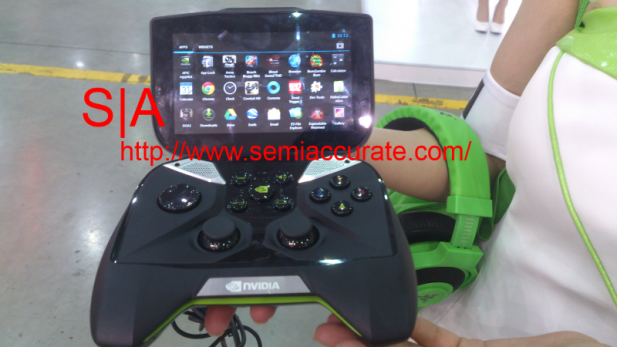 To the author, the NVIDIA Shield controller feels okay in your the hands when playing games, but it’s just that, nothing particularly special when comparing the controller to either a DualShock 3 or an Xbox 360 controller. 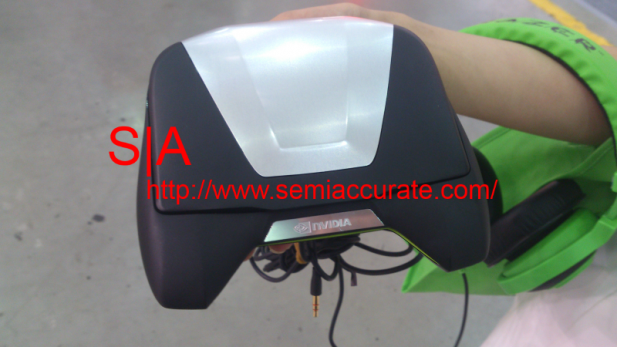 As for the multi-touch “retinal display”, again, nothing spectacular about but it works just like it should. So the game NVIDIA let people try on the NVIDIA Shield is Beach Buggy Blitz from Vector Unit, available for free on Google Play and TegraZone. The game features procedural generated racing environments and allows off-the-road racing for exploring the environment, the game itself is also optimized for Tegra 3 and above processors to provide motion blur, lens splash (simulating water splashing and the traces left on the screen) and dynamic headlights effects and collision physics that’s being touted on the Tegra 3 and above platforms. The game play is considered smooth as it should. Well the hands-on session of the NVIDIA Shield was not without hiccups, obviously, since there is still a bit of time before it hits the shelves of any game stores around. At one time, we launched another game, the game was unresponsive and required force quit through the ANR dialog. We suspect that’s because of some of the important files of the game were not able downloaded to the NVIDIA Shield. Another instance, when we encountered NVIDIA Shield for the second time on the show floor, that device froze and a soft reset was required. So we took the chance, took some more (blurry) pictures of it and here’s the boot-up screen of NVIDIA Shield. We have to wonder about the lack of a WiFi connection to enable downloading extra files for other games from TegraZone or Android market, and locking the other apps. NVIDIA might want to limit the hands-on experience to a few minutes per person on the show floor, but it’s just weird to not let people trying other games, even those in the TegraZone game catalog, or the promised services or apps on the NVIDIA Shield, especially as you can pre-order the unit already. 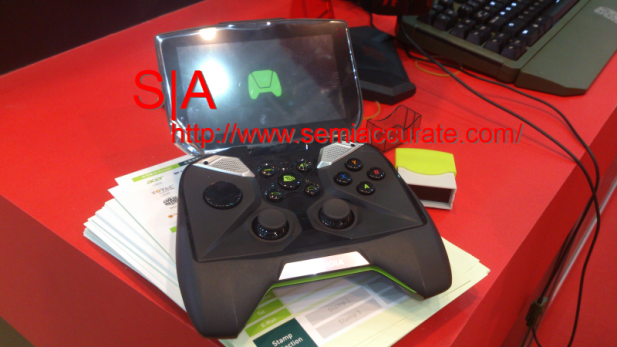 In addition, the most anticipated and the claimed killer application of NVIDIA Shield, PC game streaming, was not being demonstrated on the show floor, and NVIDIA was only demonstrating this feature in the hotel suites. *NOTE: PC Streaming will release as a BETA feature at launch. The BETA will feature a select number of supported games and a set of recommended routers. After conclusion of the BETA period, users will receive a free software patch to the official release that includes expanded game support, broader Wi-Fi compatibility, feature enhancements, and any needed bug fixes based on BETA feedback. So to put things in perspective, NVIDIA needs time to certify all the routers, the games, iron out the bugs and incompatibility issues, the bad news is all of the above will not be ready right at launch. So they put a beta badge after a hardware feature, which is previously unheard of in the gaming console market. So they want people to expect bugs, hiccups and more importantly, games/routers incompatibility until they release a software patch to the NVIDIA Shield device on improving the games and WiFi compatibility, and use the beta badge to shield off (pun intended) any criticisms about the feature. And we have to wonder if the NVIDIA Shield was an ad-hoc decision to have a hurried launch in late Q2 2013, with nothing 100% ready in this launch window. This leads us to think that the only goal of NVIDIA Shield is to claim NVIDIA still being relevant in the gaming console market.